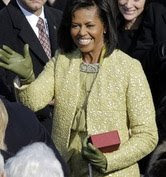 First lady Michelle Obama wore a sparkling yellow-gold sheath dress with matching coat by Cuban-born American designer Isabel Toledo for the inauguration of her husband, a choice many applauded as a cheerful message of hope and a vote for the American fashion industry. She paired the embellished ensemble with green gloves from J. Crew and green shoes. The fashion industry has anxiously looked to the election of Obama for months, embracing his wife as an emblem and ambassador of modern American style. She has won praise for her penchant for lesser-known designers and bold fashion choices, mixed with her unabashed love for mass fashion from mainstream American retailers.